Quincy’s QGV 40-60 HP brings the benefits of a variable speed drive to industrial applications where air demand fluctuates. 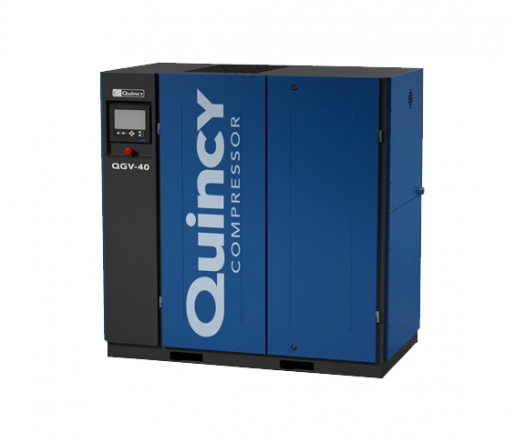 These next-generation units are ~10% more efficient than the previous QGV variable speed compressor series. The Q-Control combines the latest controller technology with Quincy’s cutting-edge and market leading compressor controller software. The resulting package provides a broad range of customer benefits, including improvements on user interface; overall reliability and uptime as well as energy reductions through improved control algorithms. Optimizing and staying connected to the compressed air system has never been easier due to the new onboard tools which include networking, basic remote monitoring and cellular connectivity services. Monitor your compressors with the new Q-Control over your local area network (LAN). Monitoring features include warning indications, compressor shutdown and maintenance scheduling, all possible with the free, online compressor status visualization. Q-Connect is a monitoring service that provides an online service performance dashboard, service logging, machine service status and monthly service emails at no charge to the customer (RighTime). The cellular hardware device (ICONS) ships standard with every Q-Control. Additional paid features including text message, email and maintenance pre-alerts are available through the connectivity program (UpTime).